Did you know that there are approximately 1.5 million heart attacks and strokes in the U.S. each year? And yet many people continue to harm their hearts with poor diets and lack of exercise. It’s time to show your heart some love! There are several things you can do to promote a healthy heart, including the proper consumption of vitamins and supplements. Antioxidants play a vital role when it comes to maintaining a healthy heart. First and foremost, they prevent cholesterol from beginning a process called oxidation. This occurs when oxygen reacts with the cholesterol in the bloodstream and causes the unwanted cholesterol to stick to the lining in the arteries.If it becomes more serious, the cholesterol can actually prevent blood from getting through to the heart and cause plaque to build in the arteries. This process is called atherosclerosis. Research has shown that vitamin C can reduce the risk of plaque buildup, or atherosclerosis.When atherosclerosis occurs, white blood cells called monocytes cells stick to the endothelium cells—these are the cells that line the interior surface of all blood vessels. When this begins, the vessel walls thicken and lose their flexibility, which can eventually lead to plaque buildup in the arteries. A British study discovered that subjects who had low intakes of vitamin C had a 30% higher chance of monocyte adhesion to the endothelial cells, which put them at a higher risk of atherosclerosis. The researchers then gave those subjects proper levels of vitamin C. After six weeks, the occurrence of monocyte adhesion to the endothelial cells decreased by over 37%. A study done at Harvard University revealed that those who had low levels of vitamin D actually had twice the risk of developing heart disease than those who had normal levels. The key is to make sure that you are receiving proper amounts of vitamin D. The average level should be around 30 to 40 ng/ML (nanograms per milliliter)—this can reduce the risk of a cardiovascular heart disease. • Salmon: Every 3.5 ounces of wild salmon contains 980 IU of vitamin D. Every 3.5 ounces of farmed-raised salmon contains 249 IU. • Eggs: One whole egg contains 18 IU of vitamin D—make sure you keep the yolk because that’s where the vitamin D is found! People generally thought vitamin E supplements were a good way to prevent heart disease, since this vitamin’s main function is to work as an antioxidant. Over the years, several randomized trials were conducted to study the link between vitamin E levels and heart disease. Italian researchers conducted a study on 11,000 heart attack survivors who took average doses of vitamin E for three years; the results illustrated that there were no preventive effects on heart attacks. 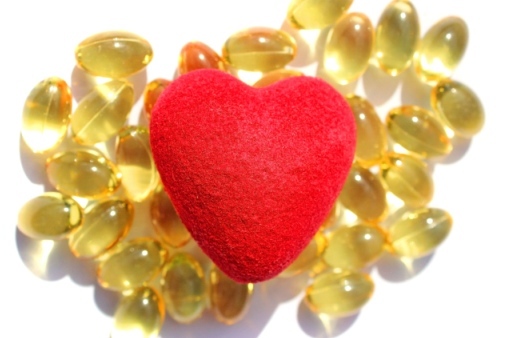 Trial results from the Heart Outcomes Prevention Evaluation study also showed no signs of vitamin E supplements preventing heart attacks amongst 9,500 men and women who had already been diagnosed with heart disease. The trial continued for another four years, and it was discovered that the patients who took vitamin E had a higher chance of heart failure! However, a recent study conducted in Israel suggested that vitamin E had positive heart benefits for type-2 diabetes patients who have a common predisposition towards oxidative stress. These patients took high doses of vitamin E and showed a reduction in coronary heart disease. Vitamin E is necessary for helping to repair damaged cells, so it is OK to consume in the proper dosages. According to the National Institutes of Health (NIH), the recommended daily allowance of vitamin E for adults above 14 years old is 22.5 IU. Pregnant women should get 22.5 IU a day and breastfeeding women of any age should get 28.5 IU. Always consult with your doctor first about the recommended daily vitamin allowance. “Can Vitamins Help with Heart Disease?” American Family Physician 1999; 60(3): 903-904. Goepp, J. “Newly Discovered Health Benefits of Vitamin C,” Life Extension web site, April 2008; http://www.lifeextension.com/magazine/2008/4/newly-discovered-benefits-of-vitamin-c/page-01. “The importance of vitamin C in our diet,” Ingredients Insight web site;http://www.ingredients-insight.com/features/featurevitamin-c-diet-fruit-vegetables/, last accessed May 19, 2015. Bird, R. “A Closer Look At Vitamin D,” Training & Conditioning web site; http://www.training-conditioning.com/2009/06/24/a_closer_look_at_vitamin_d/index.php, last accessed May 19, 2015. “Vitamin E and Health,” Harvard T.H. Chan School of Public Health web site; http://www.hsph.harvard.edu/nutritionsource/vitamin-e/#Vitamin-E-and-heart-disease, last accessed May 19, 2015.